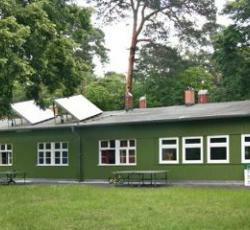 Jetpak is an eco-friendly hostel. The hostels power comes from 100% renewable sources! Come enjoy the award-winning employees, comfort and scenery at this premium Berlin Hostel. I had a amazing time. It&'s pretty difficult to get to on public transportation (you have to take the bus, though it&'s only a few minutes walk from the bus stop), but it really is right in the woods. It was charming and homey. You do have to be prepared to walk in the mud, though: sturdy shoes are important. There are some quirks to the property: the showers are the push button kind so the water was hot, but it&'s not somewhere to take leisurely, long showers after getting in from the cold. The common region is huge and is a great spot to meet other travellers in case you book a private room. The wireless was spotty while I was there, but there are numerous computers for common use. Breakfast was nice and included berliner donuts for new years (I think that&'s traditional). We were greeted with a bottle of German sparkling wine. There&'s a vending machine that dispenses glass bottle sodas for a euro: I was really impressed by that. Since we were staying during an odd time, just after news years, we were asked to move to the flashpacker hostel after two nights simply because we were the only guests left. The flashpacker was also nice and I enjoyed my time there as well, but the EcoLodge is amazing if you&'re feeling adventurous. I like the secluded location in the forest and the accompanying peace and quiet. It was nice to have trails for running/walking right outside the door. I also liked the feel; was very laid back. The staff was very nice and helpful. Fantastic lodge inside the forest! Not a party location, but if you wanted to bng your own they have the space. Rooms are fantastic and beds are super comfortable. All in all totally worth it if you are looking to get away frm the city. The location is completely fanatastic. It is within the woods near to a lake. This place is really calm has everything for an alternative, relaxing stay in Berlin. The place is fantastic. I slept so properly here. It is out of the city inside the woods. It takes about 50minutes to get to the nightlife so bear that in mind. There was a huge common room with couches, computers, x-box 360, for all visitors to use. They have a dog, whom is incredibly friendly and is still a puppy, which was fun to play with. I have not met friendlier owners than those here. They have bicycles for rent, which are competitively priced to match the lowest price you can discover in Berlin. * Jetpak Forest rated 4.78 out of 5 based on 9 customer reviews. Hostel reviews with a star rating are sourced from HostelBookers. If you find Jetpak Forest with the same booking conditions at a lower rate somewhere else on the internet after you have booked, we will refund you the total difference.